The local maxima are the largest values (maximum) that a function takes in a point within a given neighborhood. The local minima are the smallest values (minimum), that a function takes in a point within a given neighborhood. A function f has a local maximum (or relative maximum) at c, if f(c) ≥ f(x) where x is near c.
Similarly, f has a local minimum at c if f(c) ≤ f(x) when x is near c.
A function f has a global maximum (or absolute maximum) at c if f(c) ≥ f(x) for all x in D, where D is the domain of f. The number f(c) is called the maximum value of f on D.
Similarly, f has a global minimum (or absolute minimum) at c if f(c) ≤ f(x) for all x in D and the number f(c) is called the minimum value of f on D.
The following diagram illustrates local minimum, global minimum, local maximum, global maximum. Scroll down the page for examples and solutions. What is absolute maximum and absolute minimum? For each function, determine if f(x) has an absolute max and absolute min on the given interval. A critical number of a function f is a number c in the domain of f such that either f ‘(c) = 0 of f ‘(c) does not exists. and f ‘(x) does not exist when x = 0. So, the critical numbers are and 0. How to find all the critical values of a function? This video gives the definition of critical numbers and review several examples. Find all critical values of each function. Determine if Extreme Value Theorem applies to f(x) on the specified interval and if so, find the guaranteed absolute maximum and absolute minimum of f(x) on the interval. How to use the Extreme Value Theorem to find where the absolute extremum happens? Step 1: Find the values of f at the critical numbers of f in (a, b). Step 2: Find the values of f at the endpoints of the interval. Step 3: The largest of the values from Steps 1 and 2 is the absolute maximum value and the smallest of these values is the absolute minimum value. Since f is continuous on , we can use the Closed Interval Method. Comparing the four numbers, we see that the absolute maximum value is f(4) = 17 and the absolute minimum is f(2) = –3. How to find absolute extrema via the closed interval method? The basic idea of finding intervals of increase/decrease as well as finding local maximums and minimums. This video gives a graph and discusses intervals where the function is increasing and decreasing. 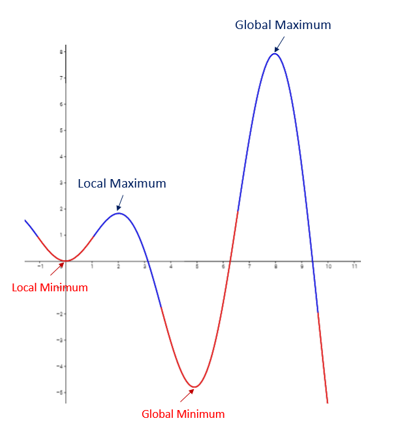 It also discuss local maximums and minimums. How to use the second derivative test to find local maximums and local minimums. This video gives the procedure, gives a short geometric idea as to why this works, and then do a specific example.